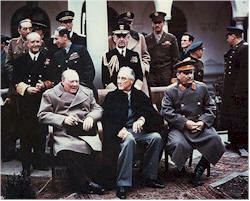 The ‘Big Three’ allied leaders – Churchill, Roosevelt and Stalin met at Yalta in February 1945 to plan for the organisation of post war Europe. Germany would be divided into 4 zones; British, American, Soviet and French. Berlin, within the Soviet Zone, would itself be divided between the 4 powers. They agreed to cooperate in the new United Nations Organisation. Nazi war criminals were to be tried and punished. The countries of Central and Eastern Europe, liberated by the Red Army, were to remain within the Soviet sphere of influence. Instead of destroying Communism, Hitler’s actions had brought it to the heart of Europe and only with American support could the traditional powers of Western Europe counter this threat. Although Poland’s independence had been the cause that brought Britain and France into the War, it, and the rest of Eastern Europe, was abandoned to the Soviet sphere of influence. The two halves of the continent would follow separate paths. The accelerated war time arms race had led to the development of the nuclear bomb enormously multiplying humanity’s powers of destruction. As the Soviet Union consolidated its new Empire in Eastern Europe, the Empires of the West European powers were weakening. Britain, France, Belgium, and the Netherlands no longer possessed the resources to maintain control of their global colonies. Nationalist leaders in Asia and Africa rejected the right of Europeans to dominate other peoples and demanded independence. In the following decades, Europeans would in some cases accept the consequences of this ‘wind of change’ and at other times resist it. After the First World War borders were moved, and new countries established while populations were largely left in place. Following the Second World War most borders stayed in place and people were moved. The exception to this was Poland which was moved westwards, losing land in the East to the Soviet Union and gaining land in the West from Germany. Germany’s formal partition into two states, East Germany (German Democratic Republic – GDR) and West Germany (Federal Republic of Germany – FRG, combining the American, British and French zones), was completed by 1949. The result was a ‘tidier’ Europe of ethnically homogenous nation states. Explain how the “partition of Germany, the establishment of Russian satellite states in Eastern Europe, and the bomb, combined to prevent the outbreak of a third world conflict”. Do you agree that the settlements were not “morally defensible”? To what extent is morality relevant in international relations?